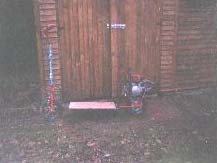 I first became interested in motorised scooters when I had a go on a Bigfoot goped so I decided to make my own. 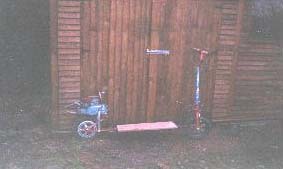 I started going to this club where I built the scooter out of a kid’s bike and some metal scraps. 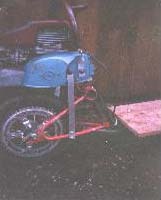 I used a strimmer motor with a spindle drive system and made a pedal clutch that lifted the motor off the wheel so the scooter could be pushed. This was extremely successful but was not powerful enough to carry an adult. The spindle also slipped in wet weather. 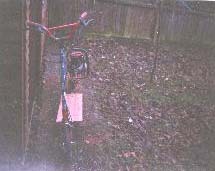 This is when I had the idea of making it chain driven with a bigger motor. I have not finished it yet but it is on its way. In the pictures the sprocket did not go with a bike chain so this had to be changed. I used a 9-tooth sprocket from an old lawn mower that I had and silver soldered it to the clutch. 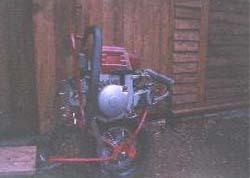 I found the motor at a boot sale near me it is an 80cc chainsaw. I do not know the speed but it should go about 32mph. I am making a new scooter with 3 gears which will be able to reach 44mph but im not sure on the revs of my motor so could be more.